Rs.26700/- per pax on twin sharing basis-Luxury(Ex-Hyderabad). Day 01: Arrival and transfer to Browns Beach hotel, Negombo for lunch. Afternoon at leisure. Dinner and overnight stay at Browns Beach hotel, Negombo. Day 02: After breakfast proceed to Kandy, enroute visiting the elephant orphanage at Pinnawela, which is a home to about 60 elephants found abandoned or orphaned in the wild. 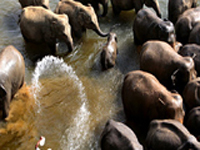 Also, accompany the elephants to a river close by to see them having their daily baths. Lunch at hotel Hilltop, Kandy. In the afternoon do a city tour of Kandy - the last capital of the Sri Lankan kings. The name Kandy conjures visions of a storied past, splendour, legend, folklore, mystery and traditions lovingly kept alive for countless years. Visit a gem lapidary. In the afternoon visit the temple of the tooth relic and thereafter witness a cultural show in Kandy. Dinner and overnight stay at hotel Hill Top, Kandy. Day 03: After breakfast proceed to Colombo, enroute visiting the botanical gardens in Peradeniya, which was originally the pleasure garden of the royalty. Nearly 4000 species of plants are found in this garden and it is encircled by the Mahaweli river. Lunch at Grand Oriental hotel, Colombo. In the afternoon do a city tour of Colombo observing the old parliament , the residential areas, the BMICH (Bandaranaike memorial international conference hall). Also, visit the ceramics corporation showroom, majestic city shopping complex, House of Fashion, and the Odel unlimited dress boutique. Dinner and overnight stay at Grand Oriental hotel, Colombo. Day 04: after breakfast at leisure or option of doing last minute shopping in Colombo. After lunch proceed to the airport for departure. Day 01: Arrival and transfer to Hill Top / Earl's Regency hotel, Kandy. Afternoon at leisure. In the late evening visit the temple of the tooth relic and thereafter witness a cultural show. Dinner and overnight stay at Hill Top / Earl's Regency hotel, Kandy. Day 02: After breakfast tour the city of Kandy - the last capital of the Sri Lankan kings. The name Kandy conjures visions of a storied past, splendour, legend, folklore, mystery and traditions lovingly kept alive for countless years. Visit a Gem lapidary. Lunch hotel. Also, visit the botanical gardens in Peradeniya, which was originally the pleasure gardens of the royalty. Nearly 4000 species of plants are found in this garden and it is encircled by the Mahaweli river. Dinner and overnight stay at Hill Top / Earl's Regency hotel, Kandy. Day 03: After breakfast proceed to Nuwara Eliya, enroute visiting a tea plantation and a factory. 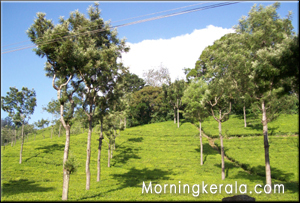 Nuwara Eliya is also the heart of Sri Lanka's tea country producing 50% of the world's best tea. Sri Lanka's highest mountain Pidurutalagala (8282 ft) is located here. Nuwara Eliya is the location for one of the finest 18 hole golf courses in asia. Check in at Galway Forest Lodge / Tea Factory for lunch. Evening at leisure. Dinner and overnight stay at Galway Forest Lodge / Tea Factory hotel, Nuwara Eliya. Day 04: After breakfast visit Sita Eliya and thereafter proceed to Hambantota. Lunch at hotel. After lunch visit the Bundala national park and do a jeep safari. Bundala is one of the largest national parks in Sri Lanka. Bundala is the home of wild elephants, wild boar, wild buffalo, deer, crocodiles, large flocks or birds and herds of wild animals. Dinner and overnight stay at Oasis Hotel/Rosen Hotel, Hambantota. Day 05: After breakfast proceed to Galle. Lunch at Closenburge / Light house hotel, Galle. Thereafter, do a city tour of Galle, one time chief port of Ceylon. Galle is famous for handmade lace, tortoise shell curios and ebony elephants. Also, visit the 90 acre Galle fort, which was originally founded by the Portuguese and later extended by the Dutch in 1663. The fort houses many important Dutch buildings including a Dutch period museum. Dinner and overnight stay at Golden Sun hotel, Kalutara / Triton Hotel, Ahungalla. Day 06: After breakfast at leisure on the beach. After lunch proceed to Colombo. Dinner and overnight stay at Grand Oriental / Taj Samudra, hotel Colombo. Day 07: After breakfast do a city tour of Colombo observing the old parliament , the residential areas and the BMICH (Bandaranaike memorial international conference hall) and visit fort. Also, visit the ceramics corporation showroom, majestic city shopping complex, house of fashion and the odel unlimited dress boutique. Lunch at hotel. In the afternoon proceed to airport for departure.